Lorne Michael Lipowitz (b. 1944) was born in a kibbutz in Israel. While still a child, his family immigrated to Toronto, Canada where he grew up (and graduated from the University of Toronto with a degree in English). He first started working as a writer for the CBC, and by 1968 moved to Los Angeles to write for a couple of comedy shows. He briefly returned to Canada in the early 70s (by now officially known as Lorne Michaels) to star in a Canadian comedy show called The Hart and Lorne Terrific Hour. While working for NBC in 1975, Michaels co-created NBC’s Saturday Night, and served as its main writer and producer. The show was an instant hit, and quickly gained popularity across the country. Two years later, the program changed its name to Saturday Night Live. It has since won 36 Emmy Awards (with 156 nominations), and is consistently among the highest-rated late night TV shows. More significantly, the show launched the careers of some of the world’s best-known comedians, including Adam Sandler, Chris Rock, Eddie Murphy, Mike Myers, Rob Schneider, Sarah Silverman, and Will Ferrell. Last week, the show celebrated its 40th anniversary, making it one of America’s longest-running shows (and longest-running late night show). It has also been ranked among the greatest TV shows of all time. Meanwhile, Michaels has served as executive producer of the popular shows 30 Rock and Up All Night, as well as NBC’s Late Night with Conan O’Brien, and since 2013, The Tonight Show hosted by Jimmy Fallon. All in all, Michaels played a key role in over 40 films and television programs. He has won many prestigious awards for his work, and was honoured with a star on both Hollywood’s Walk of Fame and Canada’s Walk of Fame. 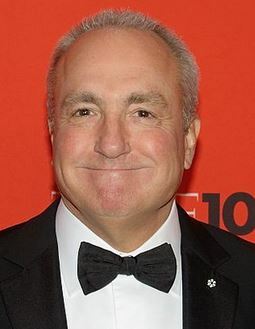 Described as America’s “primary satirical voice” and the “father of American popular comedy”, Michaels is also a member of the Order of Canada, and the TV Academy Hall of Fame. Some people like the Jews, and some do not. But no thoughtful man can deny the fact that they are, beyond any question, the most formidable and most remarkable race which has appeared in the world. This entry was posted in Arts & Entertainment and tagged 30 Rock, Canadian Jews, CBC, Emmy Award, Hollywood, Israel, Kibbutz, Los Angeles, NBC, Order of Canada, Saturday Night Live, Television, The Tonight Show, Toronto, University of Toronto, Walk of Fame on February 18, 2015 by Jew of the Week.